When Diyer Leonard came to my place recently, he brought a gift too. 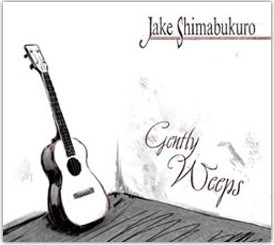 Gently Weeps by Jake Shimabukuro. Nope, never heard of this guy before but when he played the title track, While my Guitar Gently Weeps, you know why this CD is highly recommended! I’m sure George Harrison would have been proud by his playing! Lightning fast and emotive as well, all it takes is one listen and you’ll instantly be a fan! After listening to the CD, it was difficult to search for it! It is a rare (very rare) Malaysian CD with fantastic recording and mastering. The production team’s decision to remaster this album in Japan has definitely made many audiophiles happy! And I’m pleased to say that it’s even better today! Yes, they have digitally remastered this album and word has it that this version is even better than the first. Since I don’t have the first to compare, I wouldn’t bother then. This is none other than Sheila Majid’s Lagenda XVXX. I assembled a tube amp and speakers in 20 minutes! This entry was posted in Music on December 30, 2006 by yeo.